Our firm was chosen to design and write a website and collateral as well as nationally promote the revolutionary new fire safety product line for ACAF Systems Inc. of Coventry, RI. ACAF Systems Inc. has decades of experience in the fire hazard industry, and now offers a brand new device that will change the way fires are fought, forever. Being in at the beginning of a revolutionary product launch that has international relevance is just the kind of project that the staff at our designers relish. 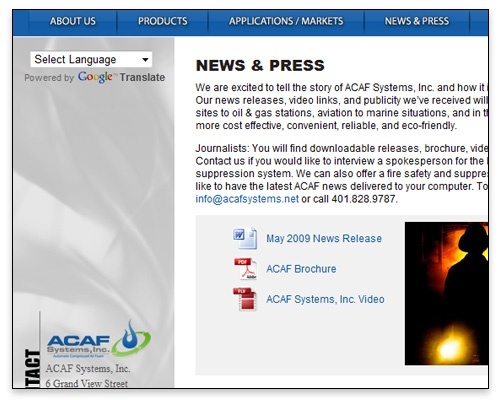 The ACAF Systems Inc. assignment included designing and producing the company’s first-ever website. Our team was responsible for crafting the content of the new multi-page web site, promotional brochure and product data sheets. The company has had an exciting year and has returned to us to develop and implement a national launch for their products, craft additional promotional materials and update the website.